Searching high and low for the perfect Christmas gift this year? Here at Babyology, we might have just found ‘the one’ and I’m here to tell you all about it! Our home doesn’t boast the impressive Market Stand & Shop by toy company Blue Ribbon but if it did, I can imagine my daughter’s voice booming out with “come buy your apples here!” or “Mummy, I’ve got yummy cakes for you to try!” She’d happily perch behind the large cart, preparing and organising her pretend play food. As it seems every four-year-old (well, all of her friends!) has a passion for play fruit, vegetables, cakes and other goodies, I know this stand would be an absolute hit. 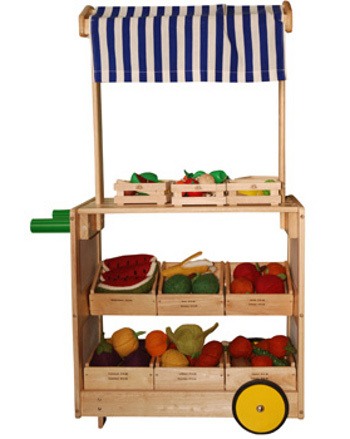 Made from sustainable plantation rubberwood, it has fantastic details like the two handles and two wheels so the shop can be pushed around, six removable wooden crates for stacking and storing pretend food and a table at the top for displaying and chopping. It’ll be ready for anything with its incredibly sturdy construction and high quality craftmanship. 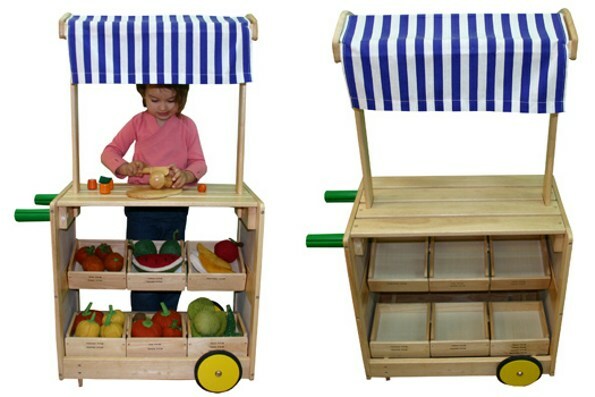 The Market Stand & Shop is available exclusively online from Eco Toys for $360 plus $15 shipping Australia-wide. Also make sure to check out Eco Toys vast range of play food and kitchen gear here.